Roundtable: Live art in the city. March 11, 13:00-16:00, Black Box teater foyer. Live art projects based in public and social spaces figure prominently in this year’s festival. The roundtable gathers many of the festival artists working with performance space outside the theatre itself. The discussion will explore the desire to engage with locations, landscapes and social contexts as artistic material in dance, theatre and installation works both in the city and its surroundings. Invited guests include festival artists Ingri Midgard Fiksdal, Tormod Carlsen, Mia Habib and Jassem Hindi, as well as Bart van de Woestijne, a close collaborator of artist Dries Verhoeven. Moderator: Hild Borchgrevink, critic and former editor of Scenekunst.no. Bart van de Woestijne, Dries Verhoeven, Fare Thee Well! Marit Grimstad Eggen, dramaturge, Oslo-version Fare Thee Well! Charlotte Blanche Myrvold, ph.d. 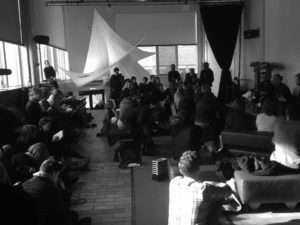 The Oslo School of Architecture and Design, Senior advisor FoU, Kulturtanken. Post-show talk with Jaamil Olawale Kosoko, Jeremy Toussaint-Baptiste, Emma-Lee Kasbergen and Thomas Prestø. March 15, after the performance, Black Box teater foyer. Originally from Detroit, Jaamil Olawale Kosoko is a Nigerian-American curator, producer, poet, choreographer, and performance artist based in Philadelphia and New York City. Thomas Prestø is artistic director of the Oslo-based Tabanka African & Caribbean Peoples Dance Ensemble. March 17, 10:00-12:30, Black Box teater foyer. There is a renewed effort in Norway to strengthen theatre studies and the use of the knowledge it produces. The viability of this academic discipline has been the subject of much debate. The University of Bergen narrowly avoided losing the capacity to offer a master’s degree in theatre studies. At the University of Oslo, the subject area is no longer offered. The aim of this seminar is to increase awareness of how theatre studies can generate valuable insights and perspectives in a number of different contexts, among others in cultural policy and the contemporary field of performing arts. The seminar is organized in connection with the conference Teatervitenskap og scenekunst i Norge – historiografi, teori og praksis (Theatre studies and performing arts in Norway – historiography, theory and practice), scheduled for May 2018 in Bergen. The seminar will be held in Norwegian.